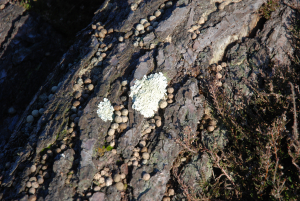 Observation - Unknown crustose lichen - UK and Ireland. Description: Crustose lichen, light grey green on he upperside of a fallen Scotts Pine, Pinus sylverstrus log. In full sun on a Dorset Dry Heath. Habitat code 4030. The rabbit pellets will aid scale. Crustose lichen, light grey green on he upperside of a fallen Scotts Pine, Pinus sylverstrus log. In full sun on a Dorset Dry Heath. Habitat code 4030. The rabbit pellets will aid scale.